Lets get started in compiling/installing the OpenDynamics libraries. For those running Raspberry Pi v1 and/or want better collision detection for mesh objects or simply don’t want OpenSim to eat CPU all of the time like BulletXNA does. Continue reading onwards to OpenDynamics physics. OpenSim System.DllNotFoundException Physics ODE errors! 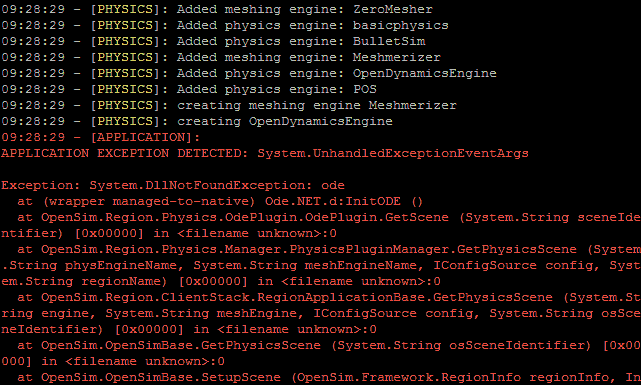 Then upon running mono OpenSim.exe you get Physics ODE libraries not found errors! Telling Mono where to go. I don’t care about OS detection so I just removed that flag! I just want it to point to my libode.so in the root of my /opensim/bin/ folder! The file name has now changed away from the ode.dll file but still CRASHES HORRIBLY in a different way because it’s not compiled for this processor. Compiling the OpenDynamics Engine for OpenSim. Once that is done. your ODE Physics should now work without crashing. YAY! Click here to return back to the OpenSim tutorial for Raspberry Pi. Note: In light of the latest additions of code to OpenSim group a group “Avination” the ODE Physics library has new life brought to it. This leads to the old instructions ready to go into the archives for anyone who may want to compile the ODE Physics as described.Since OpenSim version 7.6. ODE Physics was initially going to go into the backburner as simply a backup copy in case Bullet failed. But now it’s being pushed up to the front again. This is the old instructions to build ODE Physics for any version of OpenSim pre-dating 8.2.x . It is kept here simply for archival reasons.